New York is not just a touristy city, it’s a city of great culture. It should surprise no one then that the city is well regarded as one of the most important art centers of the world. We’re not only talking galleries and exhibits, but even within the walls of hotels, you can find entire art collections that are provoking, evocative and amazing. There are classical paintings and sculptures located in hotels in New York and you can see them for free when booking a hotel in the area. However, you may wonder what hotels are the best to see and which are worth skipping? We’ve narrowed it down to three hotels that offer the best value for sightseeing and some of the most talked about pieces in the world. Julian Schnabel, a native of Brooklyn, not only has a great eye for art but for visuals in general, as this Oscar-nominated director’s work is now the center point for the Gramercy Hotel. This Gothic-style house has strong visuals just in its décor, with its red velvets and baronial fireplaces and that’s the work of Schnabel, who helped the new owner renovate the hotel in 2003. However, the best discovery is just how much great work currently fills the walls of the Gramercy. Inside, are artistic renderings by some of the best names in art history including Andy Warhol, Jean-Michel Basquiat and others. The best feature is perhaps the rotation of great art, allowing regular visitors to see something new and delightful every time. Most artworks feature large images, the mix of high and low culture and iconoclastic pallets and idea. Surrealist Fernando Botero’s paintings are also a regular fixture. The James in SoHo, New York City, has a plethora of well known artists, nationally and internationally. The art curator Matt Jensen chooses all exhibitions and pays careful attention to detail, making sure the art complements the very structure and décor of the hotel and vice versa. One of the most unique aspects is that the hotel has fourteen corridors featuring the art of just one artist per floor. You truly meet the artist, and sample his style and inspirations as you tour the premises. Even some of the other amenities are beyond just nice perks and really delve into the artistic and bold; for ecample, there is a Glass Elevator created by Korean artist Sun K. Kwak. There is also a glass Sky Lobby adding a sense of avant-garde to the premises. The Surrey in New York has an ideal location, between Museum Mile and Madison Avenue, but inside is where the action is—there are over 30 artworks in the hotel’s public and private spaces to behold. 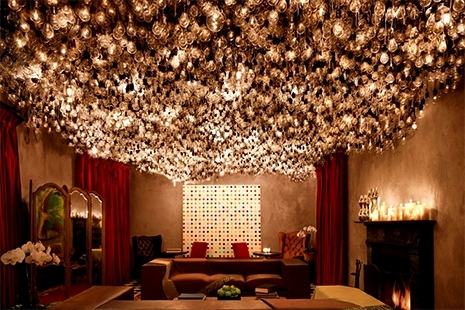 The lobby area itself is something unique and striking; guests are greeted by Chuck Close’s huge Jacquard tapestry of celebrity Kate Moss. There are also paintings by Claus Oldenburg and a video exhibition for South African artist William Kentridge. The very furniture itself is a collection of art as well as utility, as Jimmie Martin brand furniture has been made over with original artwork in graffiti style, usually of iconic imagery and language. If you’re looking for something more traditional, then check out Matthias Weischer’s exhibits of charcoal which are striking and have gained international acclaim for their austere naturalness. As you can see you don’t have to visit every single New York City art gallery to see something amazing. Simply visiting these three hotels will give you a splendid experience and allow you to observe true mastery in art, in the comfort of a vacation setting.